Zack meets Molly in a café to discuss potential living arrangements in part 1 "Zack Finds a Roommate." ECOGIG has partnered with the creator of the Sherman’s Lagoon comic to create a new 3-part animated video series and learning guide that highlights the Gulf of Mexico and the importance of healthy deep oceans. The Adventures of Zack and Molly videos and learning guide are now available to the public! ECOGIG project director Dr. Samantha Joye met artist Jim Toomey at an ocean conference several years ago, and together they hatched an idea to reach kids about the deep ocean through short-form media. “The ECOGIG program allowed us to invest in public outreach in an unprecedented way. It has been incredibly exciting to have the opportunity to work with Jim to develop a novel way to reach the public – especially kids! – and share the importance of our work on deep ocean ecosystems and its relevance to ocean health,” said Joye. Mr. Toomey is an award-winning cartoonist and filmmaker who created the popular comic strip Sherman’s Lagoon, which appears in over 250 daily newspapers in 20 countries. 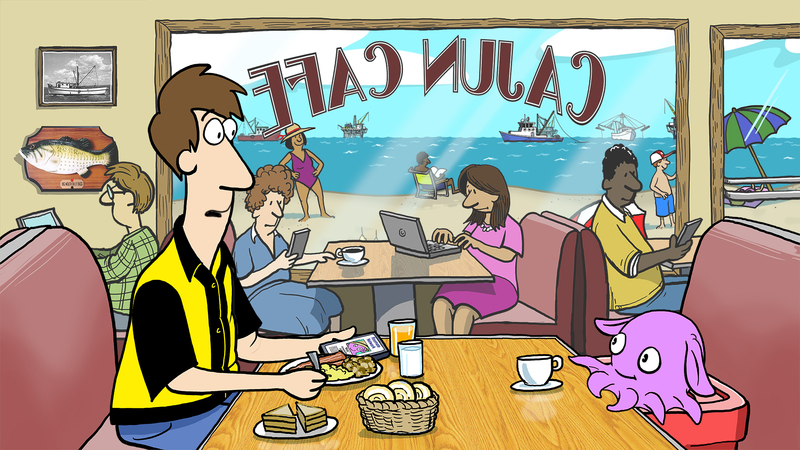 The strip’s underwater theme explores environmental issues in a way that is meant to appeal to adults and children. The Adventures of Zack and Molly follows the story of a young man who is more interested in the small world of his smartphone than the larger world around him. Zack’s online request for a roommate is answered by Molly, a tech-savvy Dumbo Octopus on a mission to tell the world about the importance of the deep ocean. The series was produced by Mr. Toomey and two ECOGIG education and public outreach coordinators working with Dr. Joye in the University of Georgia department of marine sciences, Sara Beresford and Emily Davenport. They also developed a Learning Guide to provide educators and others interested in the topics with discussion points, connections to Next Generation Science Standards, hands-on activities, and further resources. The three-part short film series has been selected by 14 film festivals from around the globe, including Barcelona International Environmental Film Festival, Green Screen Environmental Film Festival of Trinidad and Tobago, aEugene Environmental Film Festival and the Los Angeles International Children's Film Festival. The series has received Best Animation award at the Wildlife Conservation Film Festival in New York, and the Award of Excellence for Nature/Environment/Wildlife from the Best Shorts Competition. The Best Shorts Competition recognizes media professionals who demonstrate exceptional achievement in craft and creativity and contribute to profound social change. The video series and learning guide are available here: http://www.ecogig.org/zackandmolly. ECOGIG (Ecosystem Impacts of Oil and Gas Inputs to the Gulf) is one of several research consortia funded in the wake of the 2010 Deepwater Horizon accident in the Gulf of Mexico. ECOGIG is funded by the Gulf of Mexico Research Initiative (GoMRI). GoMRI is an independent research program created to allocate funds committed by BP for independent research programs following the 2010 Deepwater Horizon accident. GoMRI is guided by a 20-member independent Research Board.